Reading is important for many different reasons. It's more than just sitting down to read a book. So, this Family Literacy Dayopens a new window, we’re sharing 10 fun ways to further explore family reading. 1. So many great books have been made into great movies. Instead of jumping right to the movie, read the book together. You’ll get the family bonding experience of reading together and you’ll have so much more to talk about after the movie. Try titles like Charlie and the Chocolate Factory , The BFG (there’s really nothing more fun than reading Roald Dahl stories aloud to children), Where the Wild Things Are, and of course, Harry Potter. 2. Go for graphic novels. There are graphic novels for every age; from pre-reader, like Owly, right up to the adult level. They are usually quicker to read than a novel, so you can enjoy a complex storyline in a shorter amount of time. 3. Kids want tablet time and many of them will have it. Do a little research and find the appsopens a new window that will promote learning while playing. For pre-readers, try Squiggle Parkopens a new window, free through Halifax Public Libraries. If your family doesn’t have a computer or tablet, we’ve got you covered. You can get free access to technology at your local branch. 4. Take a trip to the Library (we know, we’re predictable, aren’t we?). Your kids can browse thousands of books and choose something they find interesting. 5. Ask for help. Library staff love to give recommendations. We’ve trained for these moments—literally. And remember to bring the kids with you for this part, because they can tell us what they like better than you can. 6. Read aloud to an animal. Dogs make fantastic listeners; they don’t judge, they don’t correct you, they just love you. If you don’t have a pet of your own, try our Paws to Read program. 7. Come to our other Library programs—we have hundreds of programs each month for learning, help with homework, puppet shows, and more. 8. Listen to audiobooks. You can borrow a book on CD or you can download free audiobooks through our Libby app. They are ideal for car rides. 9. Play a board game together. Most kids’ games require reading and math skills, and even strategic thinking. We have board games that you can play in-branch, so grab a box and pull up a table (and it’s okay, you don’t have to whisper). 10. Family literacy can be a challenge if some parents are struggling readers themselves. Right now, about 12 million Canadian adults have trouble reading and writing. If you or someone you know needs help improving reading skills, look for free Adult Literacyopens a new window programs at one of our 4 Halifax branches, or in your community. If you’re in Dartmouth, contact the Dartmouth Learning Network. 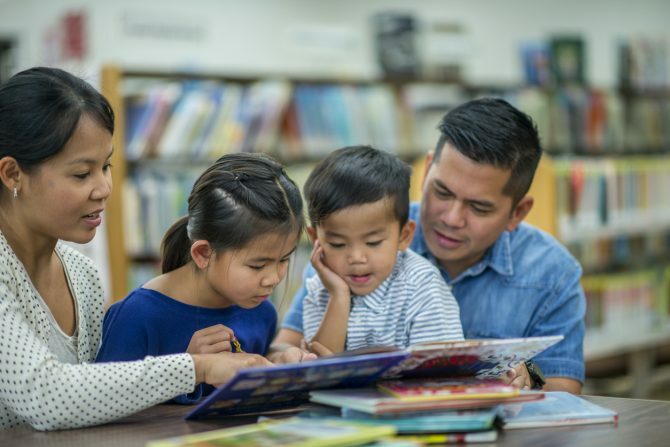 Also, be sure to check out a family literacy event happening at your local branch. Oh, and one last thing—happy reading!